It's that time of year when the postman seems to constantly deliver wedding invitations. While my kids don't seem to be the slightest bit interested in getting married, or even dating seriously for that matter, their friends are starting to take the walk down the aisle. And it's got me thinking about how proud I'd be to have my daughter or, even though she'd never be good enough for my son, a daughter-in-law make that walk wearing a shawl or veil that I had knit. So naturally I took a look around Ravelry and here's what I found. Le Bon Mariage, designed by Tiziana Sammuri. Gorgeous, right? And it looks doable. The pattern is in both text and chart format & Ravelry gives it an "average" difficulty rating. Monica's Shawl? This shawl was designed by Meeli Vent for a 2012 KAL. To knit this beautiful shawl, you'll need to go to Meeli's blog and download each KAL clue separately but it will be worth it as the pattern is free. Next up is the Snow Queen Pi Shawl. This beauty was designed by Andrea Jurgrau of Bad Cat Designs. You'll need to check out the pattern's Ravelry page to see all the details. 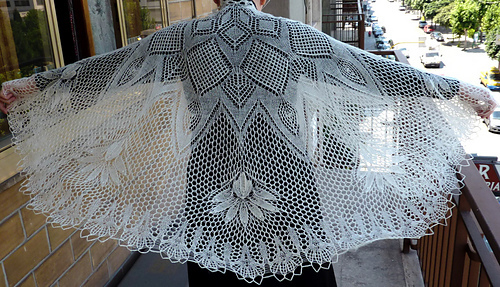 It's stunning and being a Pi shawl, it's probably not horrendously difficult to knit. One of the things I like about this shawl is how different it looks in different colors of yarn. Knit in white it's definitely Snow Queen-y or wedding-y but the Ravelry page shows one knit in aqua that reminds me of a starfish or sea anemone. I think this pattern could be extremely versatile. Or perhaps something at an even finer gauge. 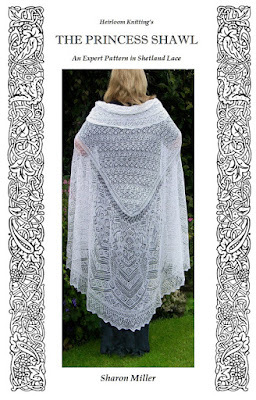 For this gorgeous shawl, you really need to check out it's Ravelry page to see all the detail. "Cecilia" was designed by Rita Maassen and is knit with cobweb. I love how the border is worked in a different direction from the body. I'd have to make one slight change to this pattern if I was to knit it myself though. Y'all know how I feel about knitting nupps. Or is it knupps? I see it spelt both ways. Either way you spell it, I'd have to replace them with beads. Or maybe you're looking for something a little fancier and with a bit of history behind it. This heirloom shawl is a thing of beauty. 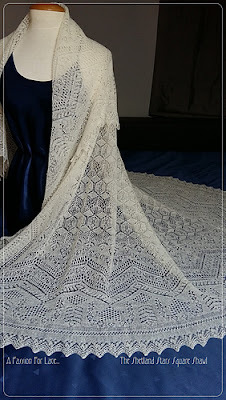 The Princess Shawl can be found in the Etsy shop, Heirloom Knitting, or on Ravelry. The pattern is so large it comes in e-book form and calls for gossamer or cobweb yarn. This one is probably way beyond my skill level but it's fun to dream about knitting it for my daughter to wear one day. This shawl/veil/piece of art makes me want to get married all over again. 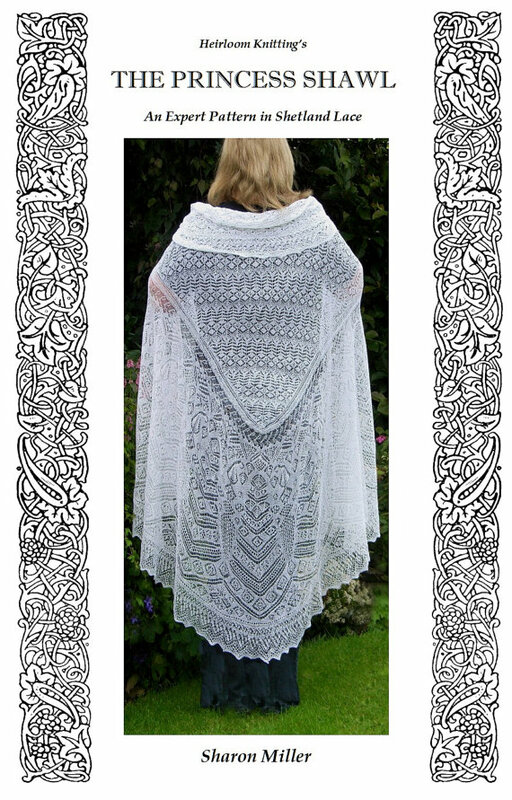 This gorgeous shawl leaves me a bit speechless. Blocked, it's six feet square and knit with cobweb or gossamer. SIX feet square! I'm still just speechless. It's truly a floor length veil. Just look at it! See? I'm so amazed, I almost forgot to name it and give credit to the designer. 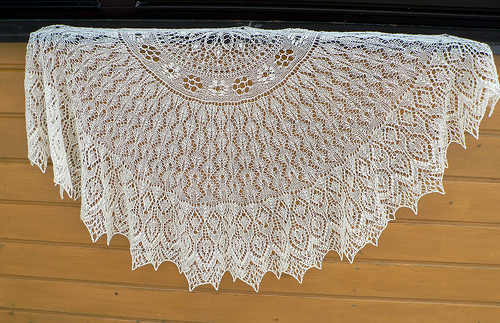 This beauty is the Shetland Stars Square Shawl from A Passion for Lace. I think it's pretty obvious Sarah won't be getting married in this veil but maybe if I started today, just maybe I could finish in time for a great, great granddaughter to proudly take the walk in it. So what do you think? 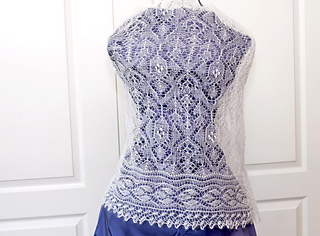 Are you knitting or have or will you knit a wedding shawl or veil? Please share your experience in the comments. Oh my... Those are masterpieces... My favorite is Cecilia - such a beautiful intricate lace pattern! Thank you for inspiration! Many thanks for talking of my design, I feel really honored you put my work in this gallery of awesome patterns! Thank you for placing my design among those great designers. Hope you have made a decision to whi h yiu will be knitting.